In celebration of Pokémon's 20th birthday this past weekend, Nintendo re-released the original Red, Blue, and Yellow games as digital downloads through its online shop. In addition to finally giving players the chance transfer all 151 original pocket monsters to newer games, the updated RBY titles also feature slight updates to certain sprites. 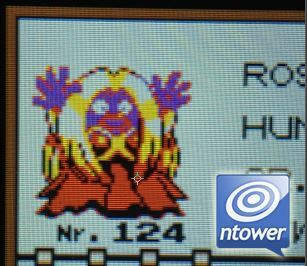 Most of the games look basically the same, but one Pokémon in particular has left a few gamers puzzled: #124, Jynx, the "Human Shape" Pokémon. In a piece for Destructoid, writer Jonathan Holmes describes how Nintendo made the decision to "purplewash" Jynx who, in the original games, had black skin. "It would be one thing if Jynx somehow bought into common negative racial stereotypes, but as a blonde haired ice witch who just happens to have features that many associate with folks hailing from Africa," Holmes argued. "I figure that Jynx's original look didn't do much to reinforce any particular idea about people (or Pokemon) with dark skin and pink lips." Holmes is right to point out that Nintendo changed Jynx's color palette, but he's beyond wrong in his assertion that the gaming company's attempt at "political correctness" is somehow a bad thing. When Jynx first appeared back in 1996, the Pokémon's color palette was limited to the black and white colors the Game Boy could actually render. Looking at Nintendo's official art, though, you could see that she (they're all female) had pitch black skin, bright blonde hair, and large, bulbous pink lips. The exact origins of Jynx's design are unclear, but one of the character's most favorable interpretations connects her to the mythic Japanese Yama-uba, an icy ghost known for having long, white hair, a frayed red kimono, and dark, frost-bitten skin. In recent years, the Yama-uba legend has given birth to the Yamanba fashion aesthetic that incorporates a number of the ghost's hallmark aesthetics. Fashion, like art, is subjective, but it isn't exactly difficult to see why Yamanba, and by extension, the look of the Yama-uba might be offensive to a Western audience. Put simply: the two bear a striking resemblance to what we might consider blackface. In order to achieve the distinctive Yamanba look, many people often apply copious amounts of brown concealer or foundation similar to the way that racially-insensitive people in the West sometimes do during Halloween season. In her 2000 essay, "Politically Incorrect Pokémon" published in the now defunct Black World Today, writer Carole Boston Weatherford described the experience of taking her kids to see the first Pokémon movie and seeing Jynx for the first time. Though her children saw nothing wrong with the character, Weatherford described her as "an overweight drag queen incarnation of Little Black Sambo, a racist stereotype from a children's book long ago purged from libraries." "Even Jynx's name—a variation on the term 'jinx,' which means a bearer of bad luck-has negative connotations," Weatherford wrote. "In addition, the name Jynx suggests a link with witch doctors and voodoo, practices rooted in African religion but often ridiculed by Western culture." The problematic nature of Jynx's aesthetic is made that much worse when you take into account the Pokémon's unique traits. Most of Jynx's mannerisms and attacks revolve around concepts of love, sensuality, and attraction. What's more, a number of Pokédex entries use the same type of racist language historically used to describe black women as simple-minded, preternaturally sensual beings. "It seductively wiggles its hips as it walks," the 1997 Pokémon Red Pokédex described. "It can cause people to dance in unison with it." Pokémon Stadium, a follow-up Nintendo 64 game to the Pokémon series described Jynx as speaking in a "strange, incomprehensible language" and noting that the species "is known for its weird wiggling that causes people to dance." Remember that Jynx, like all Pokémon, is only capable of saying its own name; its language shouldn't be any more incomprehensible than a Pikachu's. Later games describe Jynx's language as "[sounding] like human speech," while nothing that "it is impossible to tell what it is trying to say." These descriptions all bear a striking resemblance to traditional racist characterizations of different African languages as being difficult to understand. Months after Weatherford's article was published, the sequels to the original Pokémon games were released. In addition to over 100 new monsters to catch, the original 151 were given their first major update. Jynx, for the first time ever, became purple instead of black. This was partially due to the fact that the new Gameboy Color had the ability to, you know, render colors, but it's also thought that Nintendo made the conscious choice. Similarly, Jynx's appearance in the Pokémon anime was also updated to actually give the monster more of a humanoid shape and to make her purple skin the standard across all media. Jynx's purple skin may be new for Pokémon Red players, but it's a change nearly 16 years in the making. The update isn't just long overdue, but it's completely necessary considering that there's no way to flat out get rid of Jynx and her Pokédex reading from last year's Pokémon Alpha Sapphire and Omega Ruby, which still describe her motions as "so bouncingly alluring, people seeing it are compelled to shake their hips without giving any thought to what they are doing."